She was the saucy Brit who said the wrong thing at the wrong time. Every time. And she couldn’t win the battle of the bulge if it killed her. Bridget arrived at just the right time. We needed an imperfect heroine, someone who admitted she didn’t have all the answers. Her very flaws felt empowering. So why is she back on the big screen? “Bridget Jones’s Baby” strains to justify its own existence. We get girl power moments and manufactured nods to gay marriage. That’s what the hipsters are talking about now, right? When the movie relaxes, franchise star Renee Zellweger reminds us why she won us over in the first place. Lovable Bridget hasn’t changed much since we last left her. She’s still narrating her life story, although she finally conquered her weight woes thanks to spinning class. She’s unmarried but gainfully employed as a TV show producer. Life is good … enough. She even has a meet-cute moment with a handsome stranger (Patrick Dempsey) at a music festival. That turns into the first of two one-night stands. She subsequently reunites with Mark Darcy (Colin Firth), her old flame from the first two “Bridget” features. She ends up pregnant … but who’s the baby’s father? It’s a perfectly predictable template for a comedy. It still feels pathetic even by Bridget’s standards. The beauty of this franchise is how it embeds empowering messages into the films’ DNA. They often flow from Bridget’s life choices, or how she learns from her many mistakes. We get a political subplot which adds little to the story beyond beating its narrative chest over gay rights. Gay marriage is a done deal, folks. FAST FACT: Renee Zellweger married country crooner Kenny Chesney in 2005. The marriage ended four months later, with “fraud” cited as the reason for the breakup. Dempsey is utterly charming as Mark Darcy’s romantic rival. That role once fell to Hugh Grant, but his character is dispatched early on in a clunky fashion. Firth’s character once more acts like he smelled a particularly unpleasant fart. “Bridget” devotees wouldn’t have it any other way. The film’s gags range from cute to painstakingly obvious. The very best sequences involve Bridget’s doctor, played to droll perfection by Emma Thompson. “Bridget Jones’s Baby” reminds us franchises never really die. They just hibernate, waiting for their actors to need them again. Zellweger hasn’t starred in a movie in six years. Her last two features, “Case 39” and “My Own Love Song,” barely drew a crowd. Here, she’s both vivacious and torn. Who wouldn’t be, given her baby mama drama? It’s good to have Zellweger back on the big screen. The thought of a fourth “Bridget,” though, would be a v.v. bad mistake. HiT or Miss: “Bridget Jones’s Baby” delivers just enough laughs and warm memories to make up for the forced storytelling moments. Oliver Stone thinks it’s high time to rearrange Mount Rushmore. Edward Snowden, the American who leaked a treasure trove of top secret data, deserves to be join the landmark’s quartet. That’s the impression viewers get while watching “Snowden.” Stone’s hopelessly biased new feature can’t imagine there’s a contrary argument to be made about Snowden’s actions. He’s a patriot, a hero. End of argument. The far-left filmmaker is no stranger to picking sides in his films. His actions here do more than show his oh, so obvious hand. They stamp out potential conflicts in the critical third act. And the story ends with such a smug victory lap you wonder how the Oscar-winning director missed how inert that proves. 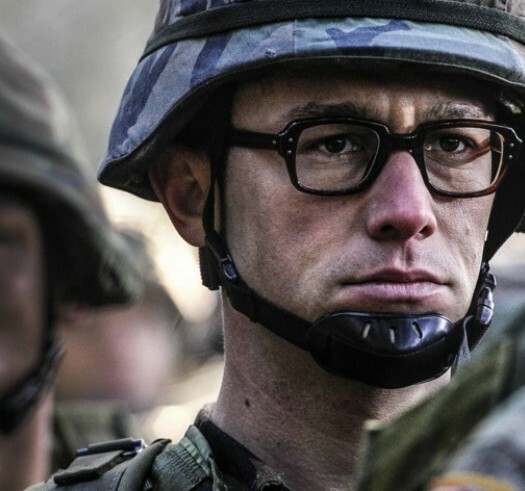 Joseph Gordon-Levitt is Edward Snowden, a patriotic American who joined the Armed Forces to serve his country. A devastating leg injury crushes his dream to join the Special Forces. He soon realizes he can help Uncle Sam in other ways. He’s a computer whiz who understands the intricacies of intelligence gathering. He rises up the spy ladder, a process that reveals the unsavory steps America takes to sustain its freedom and power. In Stone’s world, that’s viewed as diabolical to the core. That process also involves a massive spy network that isn’t content peeping on enemy states. It captures data gleaned from our daily lives, from social media interactions to the smart phone calls we place. Snowden is aghast. And he won’t stand by why the U.S. government spies on its own citizens. Is Snowden a hero? Could he have been a more traditional whistleblower to let us know about government overreach? What other information did he reveal? Did he jeopardize lives along the way? 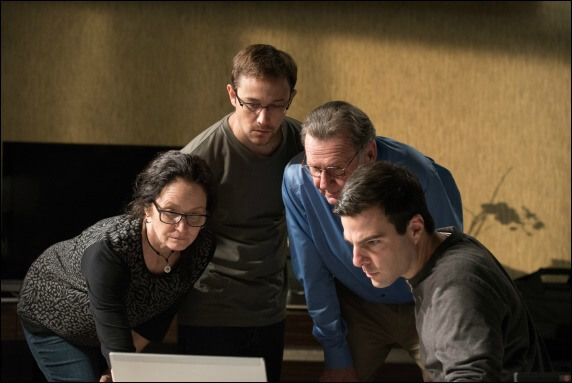 Stone delivers Snowden’s story around a clandestine meeting with a documentary filmmaker (Melissa Leo) and Guardian journalists (including Zachary Quinto). They help Snowden bring his information to the masses. He trusts them, not his government. Why? It’s a question Stone has little interest in answering even if it would have made a more compelling story. As is, “Snowden” lacks the visual pop the director brings to some projects. Gordon-Levitt is excellent in the title role, but the character is anything but charismatic. He’s soft spoken and socially clumsy. There’s nothing wrong with that. It just renders him a far less engaging protagonist. In Stone’s precious hands, Snowden’s nobility is, well, dull. Even the romantic subplot involving Shailene Woodley can’t grab our interests. She’s both loyal and confused, but their romance never reveals anything but the most obvious emotions. He’s torn between his love for her and his outrage over his country’s actions. She’s sad her beau is so grumpy and obsessed with work. This is hardly a love story for the ages. FAST FACT: Oliver Stone directed “Mi Amigo Hugo,” a fawning documentary about Venezuelan president Hugo Chavez on the one-year anniversary of the strongman’s passing. Stone gather another deep cast to bring Snowden’s story to the screen. Timothy Olyphant flashes intrigue as a morally compromised agent (aren’t they all?). So does Rhys Ifans, a mentor of sorts to our hero who doesn’t blink when the government pokes into our lives. We’re even treated to Nicolas Cage outside of his current straight to VOD trajectory. Cage’s few moments remind us how electric he can be given sober material. “Snowden” can’t help but engage in some old-fashioned Bush bashing. Its portrait of our current Commander in Chief is much murkier. President Barack Obama is seen as a savior, the man who will fix the spy games which began under Bush. Only Obama disappoints our hero. Once upon a time, Stone could deliver a sermon that didn’t put us to sleep. His imaginative “JFK” couldn’t be taken at face value. It also made it impossible for us to look away. This year’s Stone is different. He’s got an agenda, and he doesn’t notice that it robs a potential great story like “Snowden” of what makes a drama tick. HiT or Miss: Those intrigued by government spy programs will find enough to latch onto in “Snowden.” Those seeking a crisp debate over the merits of such plans must look elsewhere.